Forum Index > Historical Arms Talk > Earliest mention of enclosed helms? Posted: Sat 18 Jun, 2016 6:51 am Post subject: Earliest mention of enclosed helms? I have been searching for the earliest mention of enclosed helms being used in Europe. The earliest one I found was the famous account from 1177 at the tourney at Pleurs, when William Marshal is recorded as having his head on an anvil while the smith cuts and hammers his battered helm into shape so he can take it off. Does anyone else have any other source candidate? Also, I do find it weird that, regardless of that account, the vast majority of pictorial depictions stay faithful to the good ol' simple nasal helm for quite a while, a few to even several decades after this recorded usage of a (somehow)enclosed helm. Also, it could well be that a badly dented or deformed nasal helmet could be stuck to one's head. 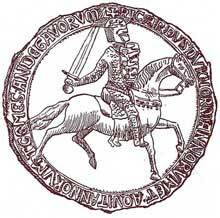 I'd hazard to guess that william marshal was wearing a precursor form like above, dated to 1207. True great helms don't really pop up until the mid 13th century. I do not believe any of the designs you presented could explain the event described at the tourney. In order of a skullcap to be stuck on the head, it would require it to be crushed into the skull or facial bones. What William was wearing must have been a helmet that encased the head and was dented beneath the widest radius of the skull, anywhere from the ears to the neck. Does Marshall's helmet need to have been a form of great helm to have been stuck to his head? rue great helms don't really pop up until the mid 13th century. These are merely two decades away from the events depicted at the tourney. L'Histoire de Guillaume le Marechal was written after his death in 1219, at the bequest of his son. Is the description accurate for the date of the event, or a reflection of current equipment, as is the case in manuscript miniatures? The Fokker D.VII was flying a mere two decades after 1898. Are we to assume there were flying aeroplanes in the late 1890s? It is a description of an event that happened in 1177, what would be the purpose of including such an event in a biography if it did not happen? You also ignore that I have a written source at least implying the existence of such helms in 1177, it is not like I am basing this on later imagery alone. The text says that the helmet was damaged in such a way that it couldn't be removed. It doesn't imply a fully enclosed helmet. Not at all. We have medieval written histories (the Weltchronik springs to mind) which describe older events in contemporary ways. It's not unrealistic in the medieval way of thinking. For instance Wycliffe's 14th century translation of the Bible has Goliath in " a brasun basynet on his heed". I doubt the ancient Philistines had bascinets. On the issue of images, here's an 1899 image of what a futurist imagined life in the year 2000 would look like. Sadly, such fighting machines weren't that far away, though they were still not available in 1899. My point being that a medieval history written in 1220 would not be unusual in applying current modes of dress, equipment, or practices to an event which occurred 50 years earlier. Perhaps the Old French original passage might shed some light on the matter. Isn't this the tournament where the judges were trying to present a big fish? Alright, I would like anyone to propose in what possible way a nasal helm or a helm with just a faceplate would be bent to result in it being stuck on someones head. You can argue that the passage is a 13th century invention and that it did not happen in 1177(something I also doubt, it being a biography and the event itself being a useless addition), but I can not see how could a non-enclosed helm bent in a way to remain stuck on someones head. A standard bascinet can be stuck on your head if it is deformed. It could also be that the tourney happened at an entirely different date than the one given in the manuscript. For instance, what if the tourney where Marshall's helmet became stuck was in 1207? The History of William Marshall was written no earlier than 1220, and possibly later. It would not be that terribly difficult to confuse one tournament with another. If the real tourney was in the early 13th century, William could have easily been wearing an early great helm. Alternatively, since the poem was meant to provide a flattering depiction of Marshall, it's possible the poet could have invented the incident to show how doughty his hero is. Personally, I don't like assuming that an incident was invented, but it certainly is possible. Either of these explanations could account for the incident without assuming that early great helms exist in 1177, when there is no other evidence to support it. Out of curiousity Dan, on what basis do you make this claim? Also, we are talking about 12th century helms here. Yes, I already accepted that possibility, read my last post. Crush the plate down near the jaw and neck and you can't take it off. As possible or how likely/unlikely that is, how would you use that same example to a pre 13th century nasal helm, with or without a faceplate? Does it matter how likely it is? It only has to happen once for it to be mentioned in an account. in fact is it MORE likely to be mentioned if it wasn't a common occurrence. By that logic an ordinary iron skullcap could also be a candidate since it being dented in some sort of impossible manner would also then be written down. The event debatably happened in 1177 and was written down in the early 13th century. So if you are arguing that did not needed to be an enclosed helm, the alternative for the timeframe is a nasal helm of some sort. I really do not see how a nasal helm would result in Williams anecdote. "With this, they left the lodgings and came to the forge, where they saw him with his head on the anvil. It was no laughing matter, far from it, for the smith with his hammers, wrenches and pincers, was going about the task of tearing off his helmet and cutting through the metal strips, which were quite staved in, smashed and battered. The helmet was so tight around his neck that it was freed with great difficulty. Once the helmet was prised off – and it was pulled off with great difficulty – the knights who had come to the forge greeted him graciously"
That settles the debate on whether it was enclosed or not. Which does not erase the argument pointed out that it might not have happened in 1177, but I believe it did. So, in case of actual physical proof, the seals I provided from the 1190s are indeed the earliest examples of enclosed helms so far? Nobody has anything earlier to provide?